FX Equation is just at good at rendering the sorts of equations that physics teachers use regularly. This makes it a very useful addition to the FX SciencePack subscription. This short video will show you how efficient FX Equation can be. Type mixed equations and text and have FX Autoquate format automatically. Advanced Bayesian analysis used to detect equations. 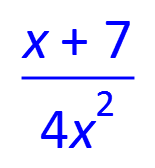 Automatic formatting of text and equations using predetermined, overrideable formatting defaults. System designed for secondary school level mathematics. Highly productive, text based equation entry system. Just type. Equations formatted as you type. Word-processor like formatting commands that apply to text and equations. Menu based equation entry that can be used instead of, or in addition to, text entry. Lower case and upper case Greek letters. Full complement of mathematical symbols (secondary level mathematics). Doublestruck symbols for number sets. Add boxes around expressions and create empty boxes. Lowercase and uppercase vectors using a variety of notations. Hats and dots over epxressions. Customisable shortcuts for complex expressions. Automatic formatting of composite expressions. Automatic formatting of mixed numerals. LaTeX customised for easy use on Moodle. Multiple output formats to integrate into your desired platform.